Earth Day is this weekend and what better way to celebrate than with a green craft. This is my 3rd year in a row to do this series. Check out 2010 and 2011 too! 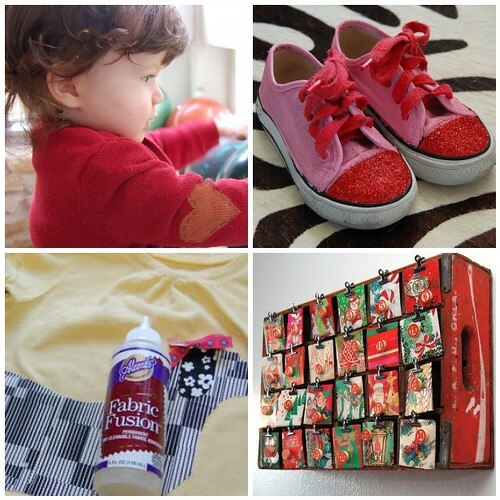 Go out grab some fabric scraps, plastic bags, Coca-Cola crates and of course your salad spinner and let's get crafty. 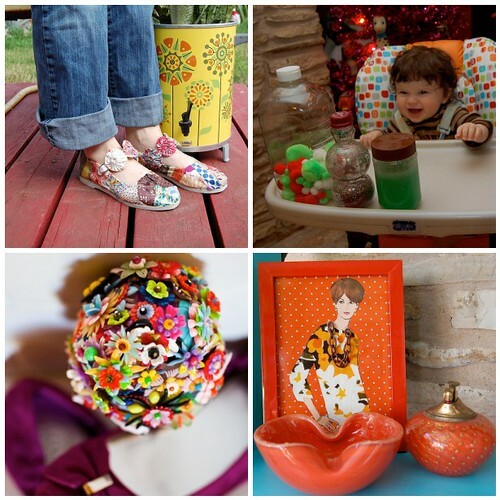 Collage Shoes - Revamp a pair of old shoes with a collage of fabric scraps. Sensory Bottles - Save all your empty bottles to make some fun baby toys. Bridesmaids Bouquet - Old plastic flower beads and vintage enamel flower brooches make for a lovely bouquet. Fabric Frock Fanny - This fun collage project uses old chain, fabric and sewing patterns. 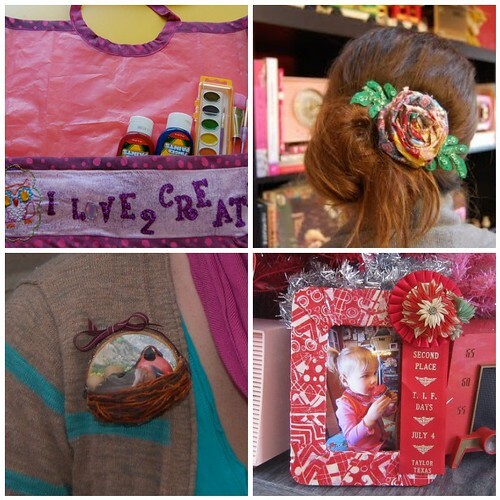 Plastic Bag Craft Smock - Plastic shopping bags keep your kids clothes clean! Rolled Fabric Flowers - Use up your fabric scraps to make fun flower accessories. Put a Bird On It Brooch - Have you seen Portlandia? Second Place Picture Frame - An old shirt and second place prize ribbon transform a picture frame. Elbow Patch Cardigan - Because everything is cuter with elbow patches. New Chucks - Make an old pair of shoes new and fancy again with a coat of paint and some glitter. Weenie Onesies - A thrift store onesie gets the one of a kind treatment with the help of some fabric scraps and Fabric Fusion Glue. Coca-Cola Crate Advent Calendar - Vintage wrapping paper and an out of date coke crate are easily transformed into a festive advent calendar. Scarf Necklace - Raid the thrift store for all the silk scarves and make yourself a unique necklace. Thrift Store First Aid Kit - There are a few things every thrifter should have in their arsenal. 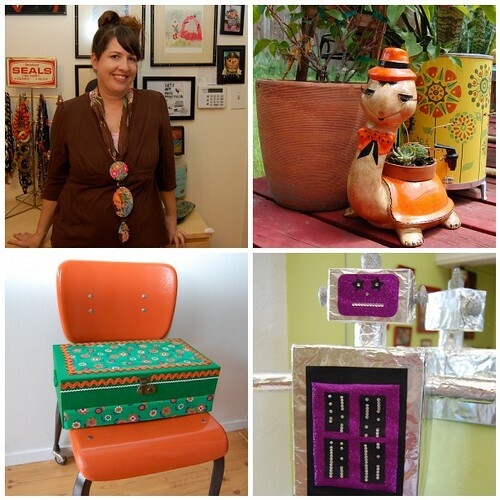 Jewelry Box - An old thrift store jewelry box is given a face lift with some Crafty Chica Paint, fabric and ric rac. Robot Wrapping - Foil wrapped boxes make for some cute wrapping paper. Salad Spinner Art - Who uses their salad spinner to spin salad? I use mine to craft. Christmas Cutie - Make a stand-up paper doll with a vintage sewing pattern, Tacky Glue and scrapbooking goodies. Make Your Own Coloring Book - Using scrap paper and some Tacky Glue you can easily make your own pad of paper or in this case coloring book. 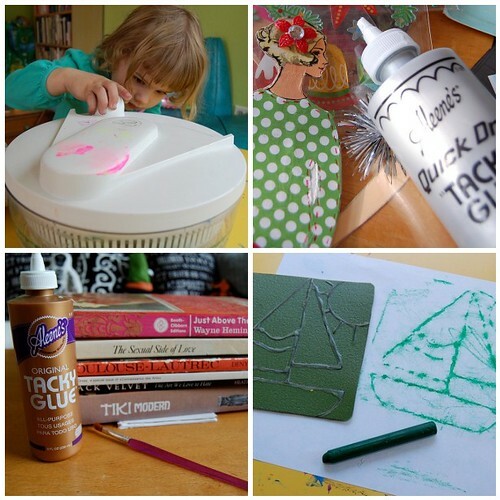 Rubbing Plates - A set of discarded placemats and some glue make for some easy rubbing plates.